Celebrating Cathy Lemay ~ Inspiring, teaching and supporting Sandwich students for 25 years! On Tuesday December 9th, the Town of Sandwich and the Sandwich Public Schools came together to honor their employees for their years of service. Deb Landry, Principal at Henry T. Wing, prepared these remarks to honor Mrs. Lemay. Cathy Lemay admits she is notoriously late for everything! But who she is and what she brings of herself to her colleagues and the children of Sandwich is always worth the wait. Mrs. Lemay says she is fortunate to be one of the lucky people that can say, “I love my job!” She can’t imagine doing anything else, except maybe starring on Broadway! 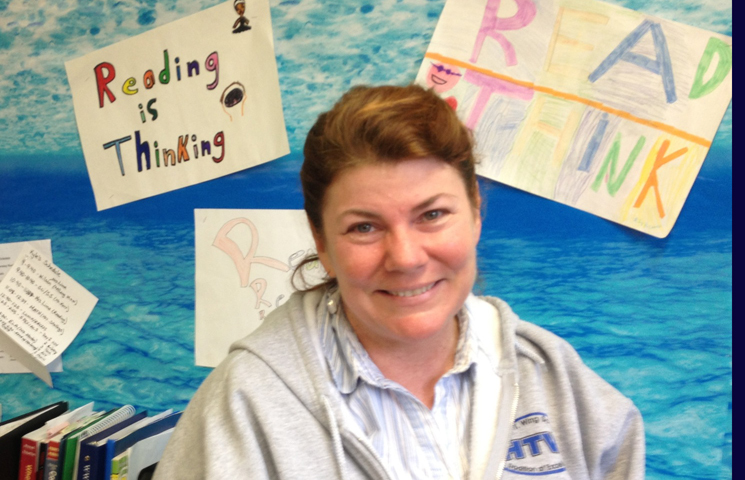 Mrs. Lemay began in Sandwich as a Special Education Teacher for her first 3 years of teaching, when Wing was the only elementary school and as she says… “We were all crammed in there! !” She has worked at the Wing School more than half of her life. When Wing was to be renovated in the early 1990s, students and staff were split into the newly built schools, so she went to Forestdale for a short period. For the past 21 years Mrs. Lemay has taught in grade 3 except for one year in 4th when she looped with her class. This fall she went back to Special Education and works primarily with 4th and 6th grade students. She also treasures all the laughs she has shared with colleagues! Mrs. Lemay is an exceptionally talented and creative person- in her writing, singing, creating, and sense of humor and fun. Mrs. Lemay can make up a song in seconds; she is the author of the modern Wing School theme song. Mrs. Lemay is an amazing teacher, so full of passion after twenty five years with even more knowledge and many talents to help her students grow. She honors their gifts and sees them as having individual genius which she cultivates and encourages in each child. Mrs. Lemay has changed lives while teaching in Sandwich. Her students love her for her patience and love of them, all the while maintaining high standards as she integrates music, dance, and the arts to “make learning come alive”. She has shared her personal talents as a thespian with the children at Wing. Cathy Lemay is truly here for the kids. Every question always comes back to what is best for the child. She always uncovers her student’s talents and embraces their uniqueness. Most importantly she cares about their hearts. Mrs. Lemay is one of the most amazing Special Education teachers one can ever worked with. She treats each child as if they are her own. She sees the “whole” person….she lives and breaths ALL of their needs…and not just the ones on IEPs. She is inspiring, and such a fantastic mentor and role model. Mrs. Lemay embodies all of the qualities you would want your own child to have for a teacher. She blends learning with fun and enriching activities that her students never forget. Whether teaching a student to ride a bike, using her prep. time to help a child learn to play the recorder, writing back and forth to former students, or bringing in clothes to help families…, she goes the extra mile to support her students. Cathy Lemay is not just an amazing teacher; she is a person who looks for the positive in all situations. She doesn’t waste her time complaining, instead she takes action. She wants to see the big picture and help to make changes that benefit everyone, especially our students. Cathy Lemay represents those that honor history, and those who have made it, but welcomes and thrives on change. She is constantly thinking, changing, and adapting while wearing her heart on her sleeve for those people, children, and causes she cares deeply for. Leadership and collaboration are qualities that come easily to her. On a lighter note, she can turn any lesson into a song or can find a song to fit any lesson. She is known for her LOVE of chocolate and is known to keep hidden stashes in special places. She is lots of fun and never takes herself too seriously. She can laugh at herself and is always upbeat! She is such a pleasure to be around! As she reflects back on these years she is realizing that, “in fact, it has been the children that have been the constant” in her life, other than her Mom, children and husband all who are loved and cherished by her beyond words…and we all know how hard it is to render Mrs. Lemay speechless. Cathy Lemay is one of the hearts and souls of the Wing School and will be remembered in its history for her smile, love of children, and the passion that she pours into everything she does. Congratulations to her for 25 years of service to the Sandwich Public Schools.